Struts 2 provides efficient way to support file uploads. There are tag library to write view in JSP. Errors can be displayed on UI which is required by the user. 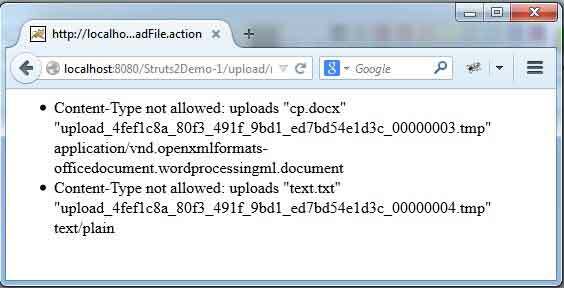 Struts 2 provides interceptor to apply required constraints for file upload. We can restrict user to upload certain content types, certain file extensions and maximum size of files. In our example, we are not using strut.xml, we are using annotation to give demo. In this example we will see multiple and single file upload. First we are describing how to do multiple file upload and then we will see how to do single file upload. To run the example, we need software as below. Before starting the code walk through, it is beneficiary that first check all the files and their location in project structure. We are not using struts.xml. We are performing our file upload task annotation based. In file upload, we need to apply some constraints. 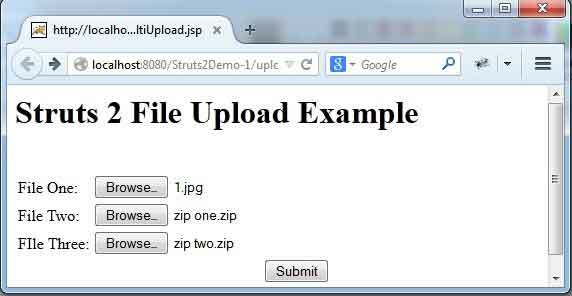 Struts 2 provides below parameters using which we can set constraints on file upload individually. maximumSize: Sets maximum size (in bytes) which is allowed by interceptor. allowedTypes: The value for this parameter can be comma separated content types. allowedExtensions: The value can be comma separated extensions. Uisng @interceptorRef we can set parameter values as below. Struts 2 provides tag library to write views in jsp. Find the JSP how to write code for multiple file upload. We need to take care that name attribute must be same for all File tag. Find the JSP for success messages. Before writing action class we must understand what convention we must follow to get uploaded file values. Struts 2 interceptor automatically defines the properties which we should use in our action class to fetch the uploaded File. 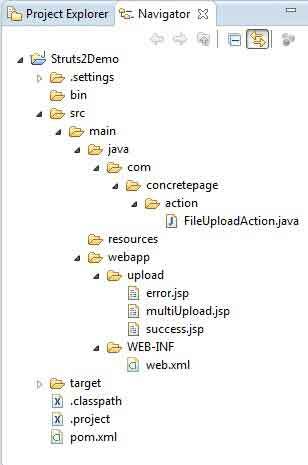 [File Name] : File: java.io.File type object that provides uploaded file data as byte stream. [File Name]FileName: File name of the File which has been uploaded. [File Name]ContentType: Content type of File which has been uploaded. Now find the action class. We have created a method that will be called when file uploaded page will be submitted. Finally we will save all the uploaded files in a location. If upload fails, because of file validation like size, content type or extension, the we can catch error. Define input result in action annotation. and use <s:fielderror/> in error.jsp as below. Find the web.xml which we are using in the demo. Find the maven dependency for struts 2 Jar. This is Upload page with multiple file upload option. If uploading success, this page will be displayed. If there is error, when user has selected the file which is not allowed to upload, the page will be displayed with the file information. And in action class, properties will be declared as below. Create setter and getter for the above properties and follow the multiple file upload action method to save the data.